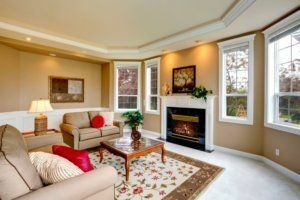 Here are some tips on how you can reduce stress levels and make guests feel at home in your house this holiday season. A warm welcome starts at your front door. A great way to determine the initial “feel “is to walk in through the front door as if you are a guest in your own home. Look at the entryway, first: it should have a festive feel. Dress the front door with a beautiful holiday wreath, and guests will experience a warm, welcoming feeling before they even step inside the door. Replace your doormat, and consider placing large urns filled with evergreen foliage that will last all winter long. Reorganizing and decluttering your home’s interior can decrease stress levels during holiday entertaining. The first place to start is the front hallway closet. Remember: Guests don’t come alone – they often bring winter coats, hats, boots, purses, luggage and all sorts of other knickknacks. Donate any winter clothing that your family doesn’t use anymore. This can also help make way for guests’ coats – avoiding having to throw them over couches, taking up valuable seating. This is also a good time to declutter the most often-used room during the holidays: the kitchen. Go through your pantry and get an accurate inventory when you are planning holiday meals. Discard any unnecessary products that aren’t useful anymore (or expired). Don’t forget the refrigerator: While cleaning the fridge out is definitely not the most exciting task, it’s critical for guest-readiness. Clear out old food, wipe off shelves and change out odor-absorbing baking soda containers before guests start poking around and big holiday meals fill the fridge with leftovers. Simple and affordable ways to brighten a kitchen or bathroom include purchasing new hand towels, as well as aromatic, sink-side hand soaps and lotions in stylish dispensers. And when it comes to a guest bedroom, try to stock the room with interesting books and magazines, which can help make overnight visitors feel more “at home.” Be sure to offer a tray of bottled waters and a lamp on the nightstand, too. Finally, extra pillows and blankets in the guest room will keep your visitors comfortable without having to ask for your help. After a big meal, guests will likely want to relax in the family room to chat over coffee or watch a show or football game together. Make sure your living room has enough chairs to let everybody sit comfortably, and that seating is arranged in a way that makes it feel cozy. Set out coasters, clear space on coffee tables for drinks and add extra throw blankets to the backs of chairs. Make sure there are enough hangers in the bedroom closets for guests. Offer clean, crisp sheets and soft, plush towels. Save sample creams and lotions; display in an attractive container for guests to use in bathrooms. Don’t forget extra toothbrushes, toothpaste and razors, as well. Make Wi-Fi passwords available and visible so guests have easy access during their visit. The holidays can definitely get a little hectic, but you shouldn’t let that get in the way of enjoying this special time of year with the ones you love the most. A little planning and preparation can make sure both you and your guests feel comfortable and relaxed while you’re enjoying each other’s company. Think you and your home will be ready for a fresh start once the holidays are over and the guests have returned to their homes? Reach out to Republic West Remodeling, one of the leading home improvement contractors in Phoenix. We can help give your home a much-needed facelift following the hectic holiday season.